Momentum's SF release party was Thursday, and it was a big success! 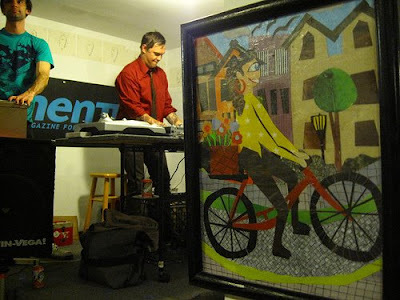 DJs Primo and Serious Lee kept the records spinning during an evening of celebration of local bike culture. The SF bike scene was well represented, with both familiar and fresh faces in attendance. Mia and Laura from Momentum were on hand, mingling, throwing out prizes, and being the kind folks that they are. It all went down at the Exit 154 art studio. 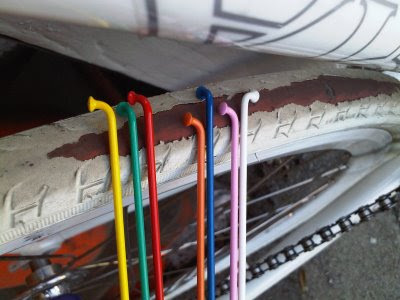 Speaking of art studios, your wheels might be deserve to be in one if you rebuild them with these nifty colored spokes we've added to our line. These will be available in 281mm and 308mm lengths, so whatever your setup, we got you covered. Stainless steel, 14g, brass nips included. Available ONLY via your local bike shop or favorite wheel builder. The colors shown below will be coming first with gold and purple coming in a month or so. Sold in sets by color, not assorted. There's been talk of a "pick up sticks" game night after they all arrive. Soma will be donating $1000 worth of Everwear tires for the ride. Wheels North recreates the historic 1909 adventure of two young men from Santa Rosa, CA, who rode their bicycles 1,000 miles to Seattle to visit the Alaska Yukon Pacific Exposition. Their adventure has inspired a group of modern bicyclists to follow the same route on the centennial of the original ride. The 2009 ride—dubbed “Wheels North”—is also a charity fundraiser for the Histiocytosis Association of America, a nonprofit organization seeking a cure for a rare and deadly childhood disease. You can help out by donating to the ride or directly to the Histiocytosis Association. 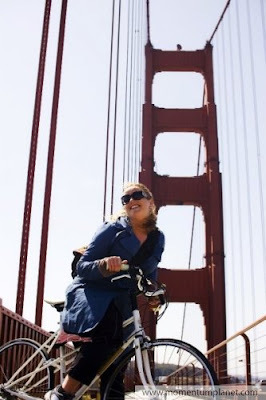 Wheels North is based on the award-winning book, “Two Wheels North,” written by Washington resident Evelyn McDaniel Gibb, the daughter of one of the original riders. Her book, based on her father’s memories and detailed research, tells the story of the 1909 ride through Vic McDaniel’s eyes. 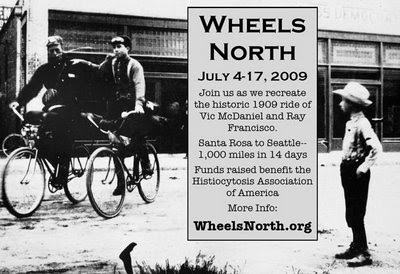 Wheels North will begin on July 4, 2009, in downtown Santa Rosa at the same location chosen for the start 100 years ago. 1,000 miles later, the ride will end at Drumheller Fountain on the campus of the University of Washington, a location that the 1909 riders would have seen when it was the famous “Geyser Basin” at the Alaska Yukon Pacific Exposition. Eric Norris of CampyOnly.com is the director of this ride. The SomaFab Shop just picked up a handful of these new offerings from Cardiff. White has been popular with the roadie and track crowd as of late. 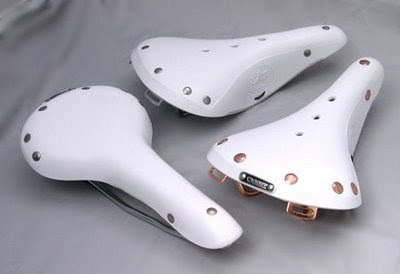 Let's see what those who are jonesin' for a more 'classic' (vintage, whatev) look for their bike will think of these saddles. The Cardiff Ltd. website is finally active if you want to investigate furthur. Just to show this blog isn't just for schlepping bike gear, we offer this public service message: Get out to your local library. Check out and listen to CD's, view DVD's for free. Read books. Amazon and B&N shouldn't be the first places you think about when looking for books. 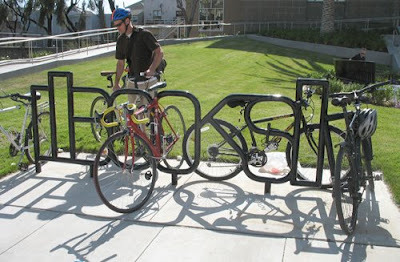 This cute bike rack is located outside the newly remodeled Richmond District Library in San Franciso off Clement St. Pick up some dim sum at one of the Chinese delis, or a Vietnamese sandwich and spread out on the fresh lawn with a good book. Actually yesterday I saw more people than usual riding to work, which is nice. Personally I will probably won't be riding to work tomorrow. I have a cold/flu bug that's just hitting its stride this morning. 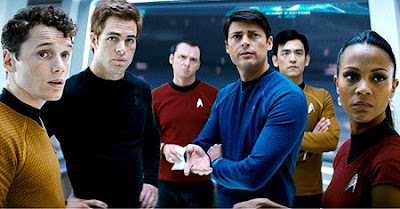 But I intend to see the new Trek movie this weekend, so if I am better I will try to make it a 'Bike To Kirk' Day. Canadian-based Momentum Magazine (the magazine for self-propelled people!) has included extra pages of local content for their copies distributed in Vancouver. This month they are launching local content versions of Momentum in Chicago and San Francisco. Can't wait to see it. Momentum will have Bay Area Launch party on Thursday, May 28 at Exit 154 (154 7th St betw. Howard and Mission).